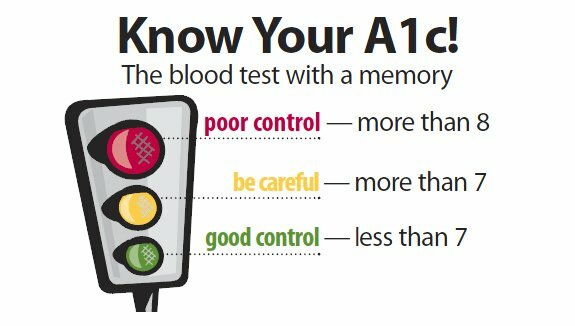 The Hemoglobin A1c (HbA1c or simply A1c for short) test is a blood test used to measure the average blood glucose concentration in your body in the past 1-3 months. For diabetics, this is the standard way of determining how well the diabetes is controlled. An A1c of less than 7% is considered good. Getting the test every 3 months (usually during a doctor visit) is usually enough. But sometimes you may want to just estimate your A1c level based on the data from your regular self-tests. The formula below could help in this case. Accuracy, of course, could vary depending on how often and when you check your blood sugar. I found it pretty accurate last time I used it. My calculation was off only by 0.1%. This is the same formula GlucoseTracker uses in the app's dashboard. So, for example, if your average blood glucose level in the past 3 months is 130 mg/dL (7.2 mmol/L) , your estimated A1c is 6.15%. There are also cheaper devices you can buy that will allow you to do the actual A1c tests yourself, like this one. If you need to do these tests more often, say every month, then it could save you money in the long run as lab tests could get expensive. It may not be as accurate as the lab tests, but my guess is it's probably good enough.